to Maximize Deliverability and Clinical Performance. Introducing the Novolimus-eluting DESyne stent - the next generation drug eluting stent with improved performance and superior clinical efficacy and safety1. 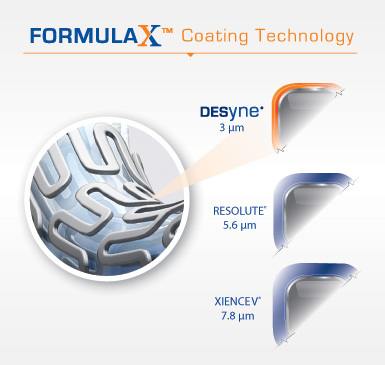 Engineered on a clinically- proven cobalt chromium platform, the novel design and Formula X™ drug/polymer coating technology allows for thin struts, lowest polymer load2, and lowest drug concentration2 of any DES on the market today. 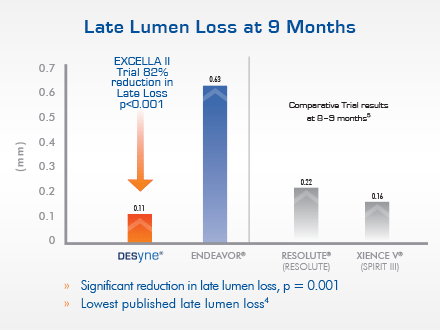 DESyne maximizes deliverability and is able to deliver superior performance with the lowest published late lumen loss4. The DESyne stent is manufactured on a clinically-proven cobalt chromium platform to maximize deliverability. Elixir Medical has completed the EXCELLA First-in-Man trial and the EXCELLA II multi-center randomized trial for the DESyne Novolimus-Eluting Stent System. In the EXCELLA study, the stent platform incorporated a proprietary durable polymer coating with an established safety profile designed to have a low polymer load and drug dose. Four and eight month angiographic late loss and IVUS analyses were completed. In addition clinical follow up has been successfully completed out to 5 years with excellent results. A stent platform that incorporated a proprietary biodegradable polymer coating designed to biodegrade within six to nine months, was also studied. Successful performance of these stents/coatings allowed the company to begin the EXCELLA II studies. 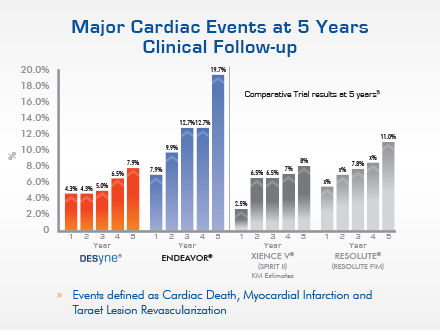 The EXCELLA II Trial was the CE-mark study which evaluated the DESyne® Novolimus Eluting Coronary Stent System compared to the Endeavor Zotarolimus Eluting Coronary Stent System in the treatment of up to two de novo native coronary artery lesions.